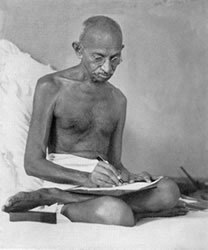 Most of us know of Gandhiji as the man who led our struggle for freedom from British rule. But did you also know that while fighting for political independence, he was also wanting to prepare the people for a new and just social order so that Independence, when it came, would be "complete". In other words, his was a struggle for Poorna (or complete) Swaraj for all irrespective of their caste, class or religion. This meant building up or constructing the nation from its smallest unit (consisting of self reliant individuals living in independent self reliant communities) upwards, through nonviolent and truthful means. The 18 point constructive programme thus became his framework for the new India he wished to see after Swaraj. Forty seven years after independence, do you think that they still have any meaning for us?